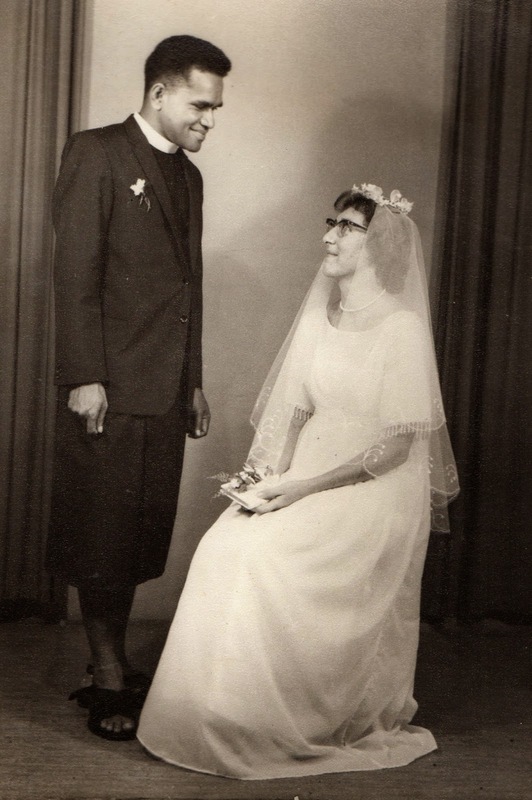 December 31 1966 - 48 years ago at Lautoka - Wesley Church, then Jasper Williams School for a reception for about 350 people. A long time ago and not so world-weary then. Tonight we are quietly celebrating at home with the rest of the family and visitors from Melbourne down at Eastern Beach with a tent, a large tanoa of kava and a barbecue with crowds of people and fireworks. We decided we couldn't walk up that huge hill easily. Just spuds and seafood, custard and pears, and a chocolate Santa for Grandpa and Grandma and watching 'Inspector Linley' on the TV! Anyway, a happy New Year to you all! This afternoon Peceli and I took a drive to North Geelong to see the art/graffiti on Geelong's very old, derelict powerhouse. We used to see it from Donation in Kind each week and it certainly looked old and decrepid. Anyway some artists got to work in the past week or so and have transformed it into a gallery. It's huge and they needed cherry-pickers to do some of the paintings. I like the face on the south wall. The artists supply their own paint, mainly large tins of house paint and spray paint. It's an ongoing process, still some spaces to cover. This is all much more interesting than a white/silver tree! I was astonished to read this story in today's Herald Sun, but what a good idea - at the time. 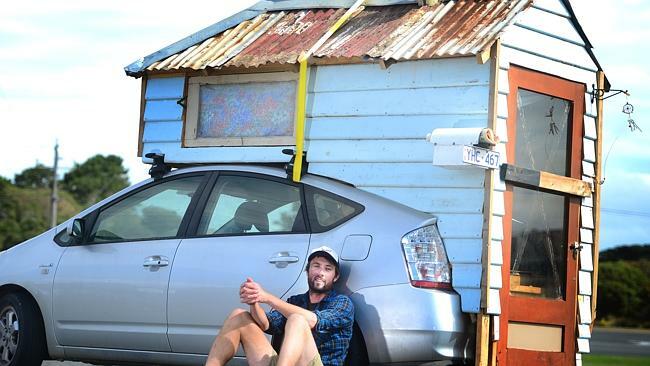 TORQUAY landscaper James Lawler has given himself room to move — on the back of his Toyota Prius. Made primarily using scraps scavenged from the tip, the miniature house set Mr Lawler back $150 and took just over a week to complete. The abode sports a tin roof with a chimney, a stained-glass window and a letter box displaying the car’s registration plate. “There’s a lot of boring camper vans out there. I thought this would be a little bit more quaint and Australiana with a rusted tin roof,” Mr Lawler said. Pictures of Mr Lawler and his DIY motor home have gone viral on social media. But aside from the online fame, Mr Lawler said the extension had served its intended purpose well. It provided a stylish place to sleep at the Meredith Music Festival in Victoria earlier this month while his fellow campers were forced to rough it in tents. “It’s quite well insulated in there. It’s more comfortable than a tent,” he said. After completing the 100km round trip to the festival, Mr Lawler was fined by local police. He disputes the vehicle is unroadworthy but said his “quirky little caravan” was worth the minor upset. It’s due to be dismantled, but it has sparked a new idea. First we went to the 9 o'clock church at East Geelong - the guys dressed in matching red shirts. We'd tried to buy Pacific style bula shirts but KMart didn't stock any and we did need a variety of sizes. The lovo (underground oven) was excellent, perfectly cooked dalo, pork, lamb, chicken,fish, palusami. Also kokoda (raw fish) salad, cassava and a fine trifle made by Grace. Andrew's palusami was a very good surprise using silver beet leaves. Vina'a va'alevu Andrew for the palusami and kokoda. My job was only the salad and to make up the menu and list of jobs! Bale prepared a nice looking table of healthy food. We had eleven people sharing Christmas lunch and the men/boys had done nearly all of the cooking. It's rest time now - some have gone off to visit a new baby in Melbourne etc. etc. and it's a quiet house. others like us, ordinary, shielding friends. with blood in the coffee shop. who could have been my friend, my family. marks you as strange, an enemy. in carol singing, without snow. and the perfect song ‘Silent Night’. is hardly quiet at all. now admired as a symbol of hope. We are waiting, despite major disquiet. 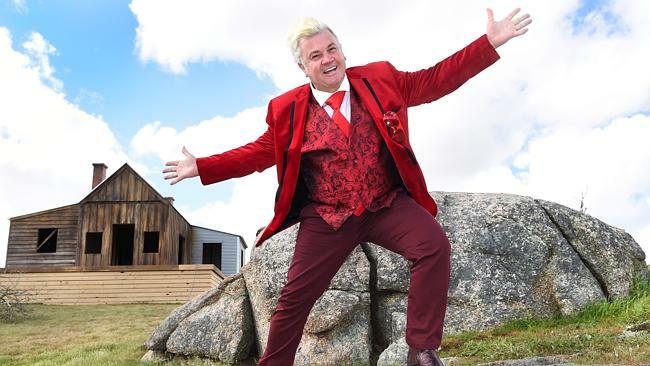 Geelong Mayor Darryn Lyons has released a new glossy brochure celebrating his first year in the top job. Picture: Mike Keating.A NEW glossy brochure talking up Geelong Mayor Darryn Lyons’ first year in the job has divided councillors.The city has printed 100 copies of a 24-page glossy booklet, Vision Passion Change — One Year On, outlining Cr Lyons’ achievements as the directly elected mayor.The brochure features an introduction by Melbourne Lord Mayor Robert Doyle who calls Cr Lyons “exemplary’’ and a quote from Prime Minister Tony Abbott saying “you are a legend’’.A spokesman for City Hall said the brochure cost $720 plus GST to print and was made to promote Geelong and lobby for the city.The spokesman said it was distributed to politicians and a small number of journalists.The brochure contains almost 80 photos of the Mayor, and in it Cr Lyons uses the words “I”, “me” or “my” more than 40 times with no reference found to any other individual councillor.The spokesman said the brochure was authorised by then acting chief executive Dean Frost. Several councillors said they were unaware of the brochure until contacted by the Geelong Advertiser. Cr Stretch Kontelj said the brochure was an appropriate way for the Mayor to reflect on his first year. Cr Jock Irvine said it was self-promotion “at its best’’. Cr Irvine said the money should have been spent on community projects, not on rec­ording past achievements. “In this 24-page book about his first 365 days it’s all about him and not about the other councillors,’’ Cr Irvine said. The Rotary Donation in Kind volunteers had our Christmas breakup barbecue yesterday at the North Geelong site near Osborne House. Peceli and I have enjoyed being part of this project which sends about fifteen containers to South Pacific and South-east Asian countries each year. This includes Fiji but at Lautoka they whack on a whopping $3000 customs charge for the excellent second hand goods that go to schools and hospitals. Not happy about that. One of our helpers makes about nine hundred lovely wooden toys in his workshop each year to give us to send to kindergartens overseas. A quiet achiever much appreciated. Here's a list of the houses in Geelong with decorated front gardens etc. I found this in the Geelong Advertiser. I noticed that the suburbs with most decorations are not the posh suburbs with expensive houses. If it's hard to read, then enlarge. Here are a couple of pictures - using colours, then turning them into pencil like drawings using Picasa. Rather ordinary though. Queenscliff pines near the beach, and Barwon Heads near the heads. Tonight we went to the breakup party at Diversitat at the Hub in North Geelong. For nearly thirty years we have been associated with the Geelong Migrant Resource Centre, now called Diversitat; and value the input into the Geelong community of this organisation which helps to make our city value diversity and multiculturalism and care for the stranger in our midst. Tonight we sat with friends who had once upon a time migrated from Spain or Philippines. I was delighted to meet up again with Petra who is now 89. We once had been in a writing group and I helped edit a book of migrant stories. THERE are many things we learned about our city in the past 12 months. Here are 10 to start with. 1. WE are global. The opening in June of Carbon Nexus, Deakin’s $34 million carbon fibre research centre, has attracted interest around the world. It is the kind of research and development centre that will drive innovation and new technology for our region and beyond. Great to see Jane den Hollander win the Committee for Geelong Leader of the Year award as Jane is an absolute inspiration and tireless advocate for our city. 2. WE are innovative. The construction of the new six-storey, state of the art Geelong Library and Heritage Centre will be a wonderful centrepiece for our new arts precinct. This is the kind of design for which we want to be known. This excellent public amenity incorporates a flair for the new and edgy matched with a functional design for all to enjoy. I can’t wait to see it when it’s opened. 3. WE are vulnerable. We have seen this in light of the loss of Alcoa and Ford production and the thousands of related jobs. Yet despite this devastating news we are still strong and united and optimistic about this city’s future. 4. WE are caring and compassionate. Our citizens have shown this on many occasions this year, including the outpouring of grief after the tragic death of young asylum seeker Leo Seemanpillai and the generous amount that was raised to support his family in a refugee camp in southern India. Likewise the great support given to Rory Wilson after his cycling accident. 5. WE are creative. The inaugural Mountain to Mouth and Geelong After Dark showcased many of Geelong’s artists and went on to win the Best Community Event at the prestigious Australian Event Awards and also VicHealth’s Building Health through the Arts Award. 6. WE love Christmas. This is clearly evident with the thousands who have flocked to our brilliant new floating Christmas tree. Lighting up Geelong for Christmas is a great idea and even better when we know that this project was built here by a great Geelong company like Hanlon Industries, a typical Geelong quiet achiever that often goes unrecognised but makes a really positive contribution to our city. Full marks to our mayor Darryn Lyons for this idea. 7. WE are proud. We don’t like being called zombies or Sleepy Hollow, as evident in the outpouring of anger over the short clip by Geelong Tourism. Justifications aside, Geelong people are rightfully proud of our city and region. The resulting debate after the video was testament to the reality that we are concerned about our reputation and future. 8. WE count! We saw during the recent election that Geelong was a priority for both the major parties, with Labor launching its campaign here. The pledges from all sides were welcomed and we need to see more as we know things are not getting any easier on the economic front. With our two new state ministers and member for Geelong we expect big results for Geelong. 9. WE are welcoming. The inaugural Welcome to Australia walk, which we held in Geelong on October 25, was well attended for a first event and it will surely grow over time. This is on top of the generous support and acceptance that newly arrived people receive every day from the majority in our community. 10. WE are resilient. Although we don’t have the resources and opportunities Melbourne has, Geelong is a better place to live. More and more people from outside our region are finding this out as they move to our fair city and surrounding districts. Our community is working hard to transform this city through difficult circumstances and together we will succeed. Michael Martinez is the chief executive officer of Diversitat. 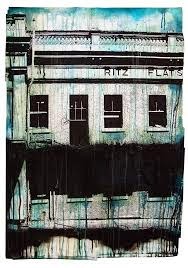 Two eye-sores in Geelong are the Ritz and the burnt-out house in Ryrie Street next to the eye doctor. Nothing has been done in years to force the owners to clean up. At least the Geelong Council are deciding to fine the owners. .OWNERS of dilapidated buildings like the Ritz who refuse to fix their properties could be fined $2000 a month by the City of Greater Geelong. Deputy mayor Michelle Heagney, who is responsible for the planning and central Geelong portfolios, yesterday said the council was embarking on a process which would allow it to fine irresponsible property owners. Cr Heagney said “the Ritz law” was part of a local law review looking at what council could do to make owners of derelict Geelong buildings more accountable. “There’s a new clause in our local law which they’ve put in place and it’s specifically aimed at the Ritz building,” she said. At Tuesday night’s council meeting, where councillors voted to approve the Local Law Review, Cr Heagney said the City was putting all negligent property owners on notice. “We’re coming and we’re going to get you, so start looking after your properties,’ Cr Heagney challenged. 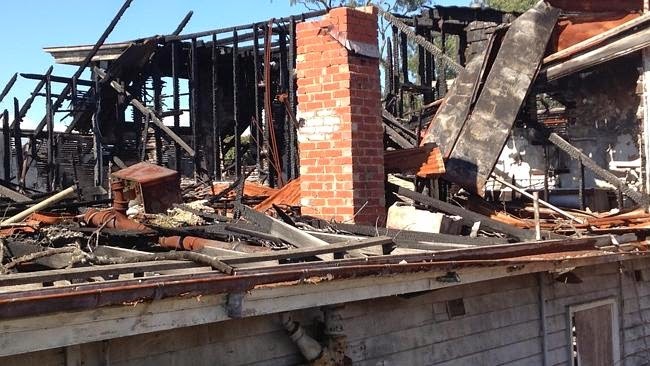 The strengthening of the dilapidated buildings law is just one of a number of changes to local laws signed off on by the Geelong council this week. The owner Rex Harding, who lives across the road from the dilapidated and burnt out house, said at the time of the blaze that he had experienced problems with people jumping the security fence and entering the house. Greetings to you from Peceli, Wendy, George, Bale, Epa, Jordan, Andrew, Big Andrew, and household. We are reminded of Christ’s birth with the carols, messages, decorations and the huge conical tree in Geelong that lights up the sky in the night. Let us honour and pray for one another, for miracles in our world today and may this message of good will give peace to you. Our compound, now called Vatuadova Kisi often has a dozen or more people living here with visitors, the extended family, and friends of our teenagers and even the touch rugby gang rock up. There’s kava flowing several nights a week. Relatives from Sydney have been staying in Andrew’s bungalow and Andrew’s new house went up early in the year. Next year Linlay will start school at Form 2 at Geelong High School. Jordan finished Year 12 and Andrew Year 10. Jordan recently had surgery to take out the plate and rod in his leg, and he is recovering well. 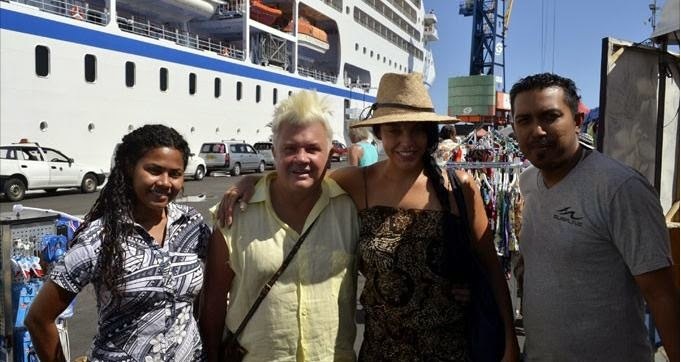 Earlier in the year Peceli and the two Andrews went to Fiji for the funeral of Peceli’s brother Dakai. Health continues to be an issue for us oldies with pills and checkups. The young ones in the family play tennis summer and winter for East Geelong Uniting – the club that lost their clubroom and courts with the Uniting Church kerfuffle, but have relocated to Breakwater. Peceli and I often go for drives and simple picnics to enjoy the beauty of the Bellarine Peninsular. Church news – Peceli continues his relationship with Altona Meadows/Laverton and I still play music at East Geelong and talk too much at council meetings. 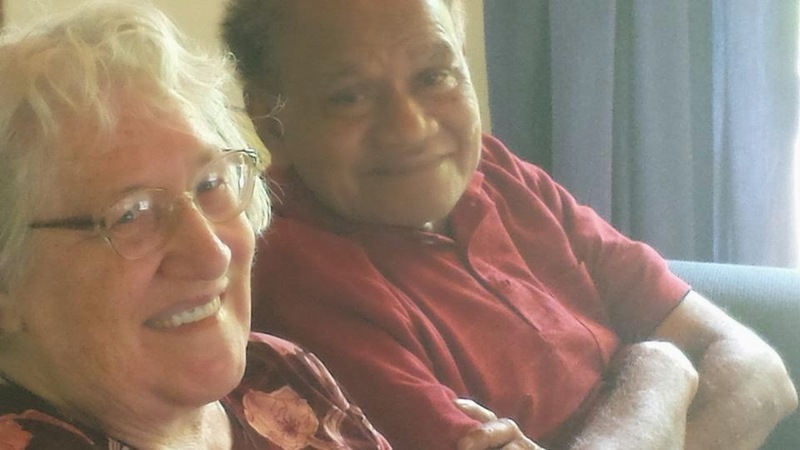 The members of South Geelong who lost their church have joined out church at East which is doing well with community service – donating a vehicle to the Women’s Crisis Centre in Tonga and setting up the teaching of stringed instruments at a local school. We will have a second minister coming early next year which is a bonus. Rev Ikani continues to be an inspirational leader of our faith community. Community news – Geelong has problems re unemployment with places like Alcoa, Ford and others sending staff off or even closing down. Despite the enthusiasm of our new Mayor for tinsel and glitter, there’s a lot of pain out there. However there is much volunteer activity going on such as free meals at Christ Church, and care by Diversitat and others for the refugees coming into our community who are not allowed to work. We continue to help at Donation in Kind though interest in Rotary is waning. Geelong continues however to be a place that we love to reside in. Loloma and best wishes for the Christmas and New Year season. I just started some decorating in the house but the old plastic tree is lopsided and the old decorations are somewhere lost in a plastic bag in the garage! So I just started with this on the table. Even a star managed to get into the picture. (I'd bought a $2 packet of shells at an op shop the other day when looking for egg cups because ours seemed to have disappeared.) Also I bought a bundle of inexpensive Christmas card though I barely use snail mail at all. Only two cards out of forty were what I like. Too much clutter of things that don't matter too much to us in out last chapter! 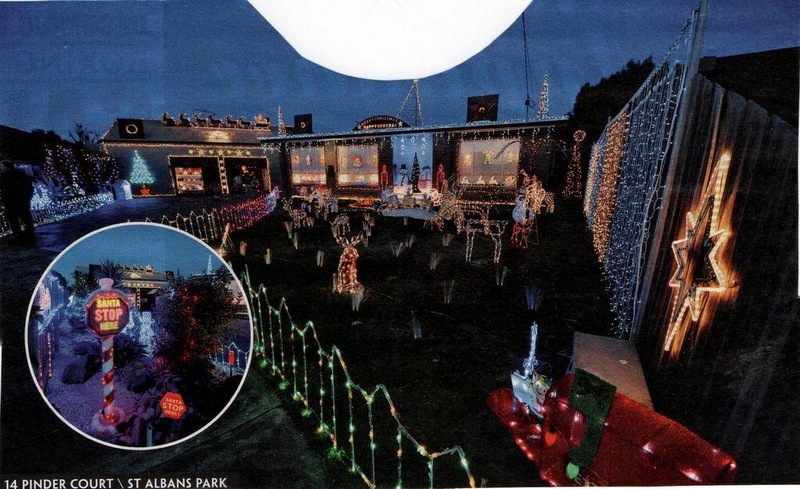 IF it’s a Christmas lights trail you’re looking for, we’ve got you covered. 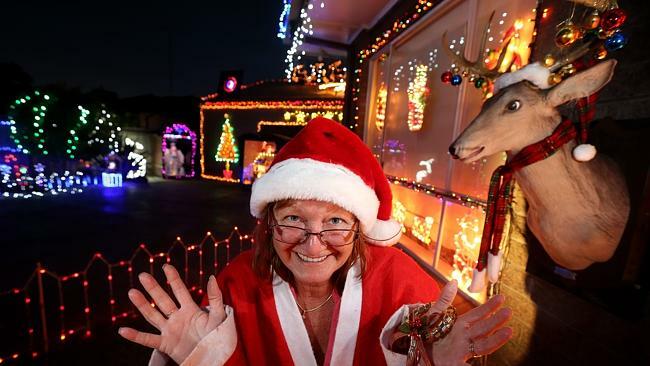 From Bannockburn through to Queenscliff, scores of homes across Geelong have plugged in their spectacular festive lighting displays.